We at 1 EDI Source, understand that things move quickly in the e-commerce world. 1 EDI Source has been creating and sustaining EDI solutions for thousands of customers for decades. We understand that our customers want to have an extremely reliable EDI Solution, but also want a solution that is optimized to work as quickly and as seamlessly as possible. EDI/HQ is designed to do just that. It’s exactly why the exporting and importing of business objects in EDI/HQ was introduced. Have you ever had to re-create trading partner setups, jobs, processes, reference tables, custom transaction filters, or file definitions because they are in your testing environment, but not in your production environment? Those days are no more with EDI/HQ, because now you can export any of these objects out of your test environment, and import them into your production environment. This is obviously a huge time saver, and can allow you to work in your test environment freely, without dreading the idea of building all of these objects a second time in your production environment. This feature is extremely useful for saving time, and it also eliminates the chance that errors may occur due to a mistake while manually rebuilding your business objects. Using this Export/Import feature is much like the copy/paste function that you undoubtedly have used. Imagine having this type of simple functionality, but with complex jobs, trading partners, and data conversion reference tables! 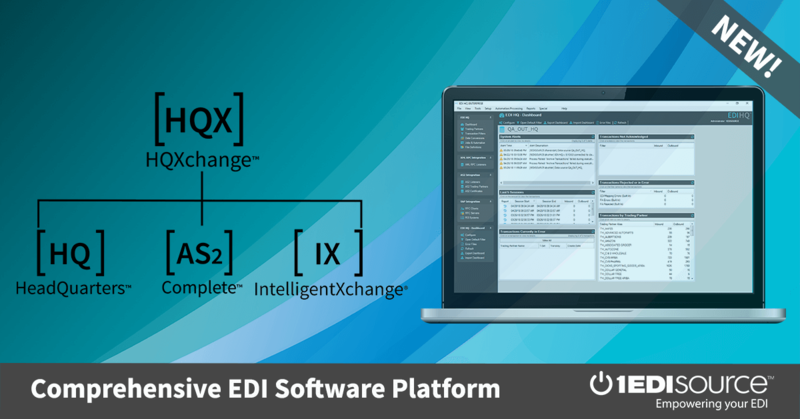 This is just another example of how we at 1 EDI Source are continuing to improve and optimize our industry-leading software. Contact us to learn more about our innovative EDI solutions.